In order to keep the series alive, England needed a win in Mumbai considering that they had been trailing 2-0 in the series. However, with Kohli’s battling master class, the visitors needed something extraordinary to save the game. 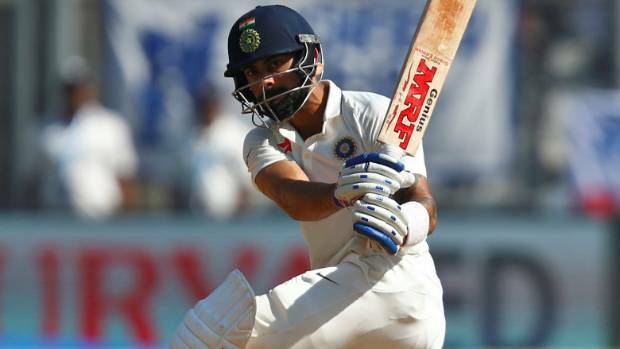 Virat Kohli, the Indian Test Captain, went all out, scoring a sublime double century for India as his bowlers went on to pick up six England wickets, thus putting the hosts on course to clinch victory at the fourth and penultimate test. The match, played last week Sunday, at the Wankhede Stadium, saw India pile on 631 in their first innings, thus leading over England with 231 runs, following the double century from Kohli, which was his third for the year. In their second innings at stump, the touring visitors, were still 182 for six as they trailed behind by 49. Jonny Bairstow was unbeaten on 50 and falling for two in the last over before the close, was nightwatchman, Jake Ball. First innings centurion, Keaton Jennings was dismissed by pace man, Bhuvneshwar Kumar, for a golden duck, while England’s captain, Alastair Cook was sent back by left-arm spinner, RavindraJadeja for 18 and Moeen Ali for nought. England was thus left tottering at 49-3 at tea. During their stand of 92, Joe Root and Bairstow went on to hit brisk fifties for the fourth wicket. The former fell leg before to off spinner, Jayant Yadav for 77. England’s hopes of saving the match was further dampened by the wickets of Ben Stokes, who ended up making 18, and Ball to off-spinner RavichandranAshwin, towards the end of the match. Kohli, 28, was earlier out for a career best of 235, but added 241 for the eighth wicket, thus making history as the highest so far for India.